One of the most common questions we get when working with a client on their WooCommerce website has to do with setting up variable products. Variable products can have multiple variations/options, each of which may have a different SKU or price. For example, a piece of clothing that is available in a variety of sizes or colors. 2. Keep in mind that on the attributes menu you will add the ‘name’ of the attribute, not the individual options. Let’s add Size. 6. 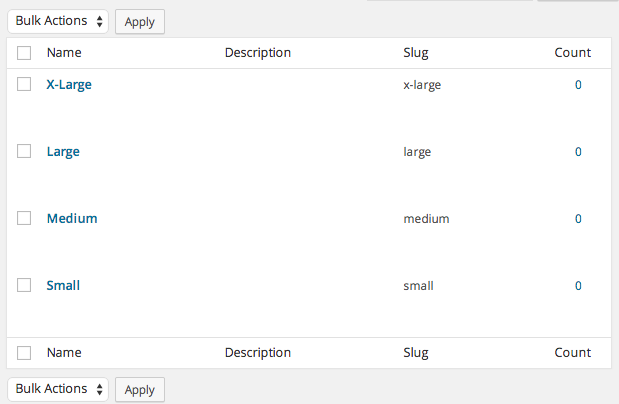 Now the size attribute will be available to you when adding a variable product. Now we will cover how to add a variable product. Adding variable products is very similar to adding simple, but with the selection of variable as the product type, additional tabs are added to your product data section. Enter SKU of your item. Note: you will enter SKUs for variations later on. Here you can set the stock quantity for the product, or leave it blank to use the stock settings on the variable product’s. Enter the weights and dimensions of the product, or leave it blank to use the stock settings on the variable product’s. Same process as simple products. Refer to Linked Products section above. Here is where the differences between simple and variable products begin. In the following example, we will use an attribute we have already setup: size. Don’t have any attributes? Read How To Setup Attributes in WooCommerce. Select size from the drop down menu and click add. Click select all to add all sizes. If you would like to remove any options, click the x next to the term name. Select visible on the product page if you would like customers to choose from these sizes. 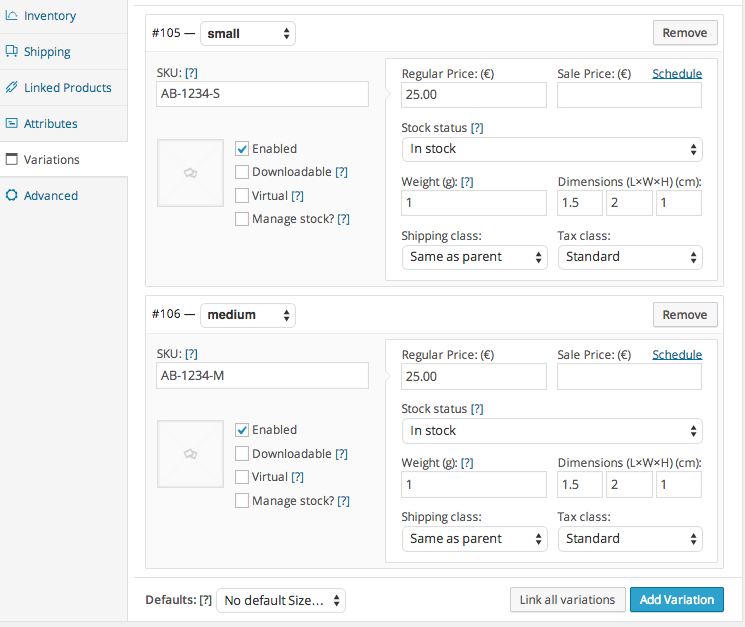 Then, click used for variations if each size has it’s own sku/price/weight/etc. Make sure to click save attributes as these will not be visible on the variations tab until you do so. 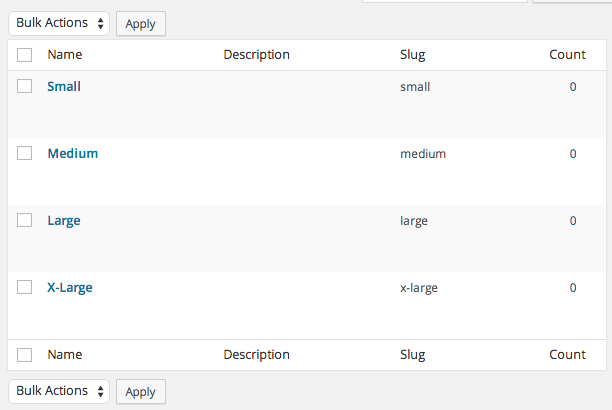 On the variations tab you will add all of the product data for each individual size. First, click the ‘add variation’ button 4 times if you will be using all 4 sizes. Select the name of your sizes from the drop down menus. Then, fill in the product data for each size. Note: variation price is required or the variation will not show up on the front-end of your website. If you fill in all the product information for your variations, you will now be able to see them on the front-end of you website on your product page. On the advanced tab you can set up an optional purchase note to be sent to the customer after purchase, a custom ordering position, or enable/disable customer reviews for the product. For a more in-depth look at adding new products, be sure to read A Guide to Adding Products in WooCommerce. Or, How to set Featured Products in WooCommerce. Want to learn more? Check out WooCommerce: The Ultimate Guide. Have questions? 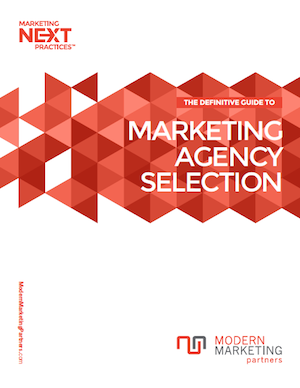 Modern Marketing Partners offers comprehensive ecommerce and marketing services. And we love WooCommerce! Leave questions in the comment box below or contact us today! This was exactly the information I needed! Very clear and helpful. Thank you so much. Is there any option to fill the price detail same as parent for the variables? Excellent tutorial! Thank you sooo much! 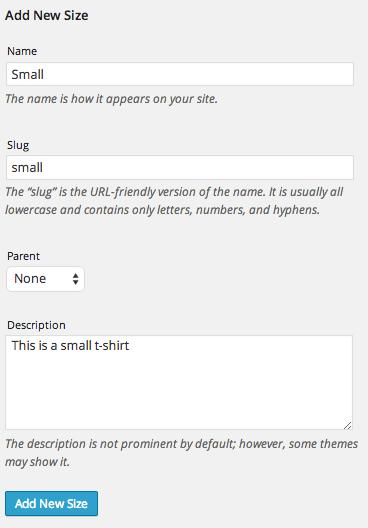 Would you be able to have the customer select sizes via buttons rather than a drop down? Years on and its still good!